Neat Builders is a small family run building business based in Carshalton, Surrey. With over 25 years building experience we have a reputation that is well known throughout. ​Every job is carried out to a high standard and finished on time within the agreed quote. We also offer daily progress reports and photographs for any customer who cannot be present during their works. We understand how stressful having any building works can be, so we offer this service just to make things go that little more smoothly for you. ​We can also provide sub-contractors for various other trades including Central Heating and Carpets. Kensington, Battersea, Chelsea, Fulham, Wandsworth, Putney, Clapham, Balham, Streatham, Tooting, Merton, Carshalton, Wallington, Sutton, Croydon, Kingston, Tolworth, Surbiton, Chessington, Epsom, Ewell & Leatherhead. 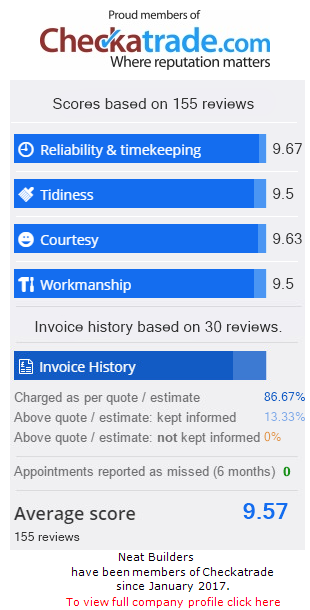 You only have to read our reviews to know that you’re in good hands.